The Anatomy of Inequality is not primarily a normative text but attempts to trace the social mechanisms that give rise to inequality. The idea behind this approach is that it is necessary to understand the dynamics of social interaction before embarking on a policy discussion, if inequality is perceived as a problem. The analysis focuses on some simple games known to everyone – the game of marbles, negotiation games – which are used to show that an egalitarian equilibrium where everybody is equally wealthy is unstable and, when left to itself, will eventually degrade into a state of pronounced inequality. This holds even if all individuals are identical with respect to capabilities and effort. Using analogies with technical systems, it is then shown that a welldesigned policy of redistribution can prevent this from happening. Three chapters are devoted to the liberal, conservative and social-democratic traditions, respectively, in the light of the previous analysis. The book ends on a positive note, arguing for the possibility of egalitarian policies in a world where many countries are currently moving in a different direction. # 6 on bestsellerlist of Hedengrens bokseller in Juni 2014! 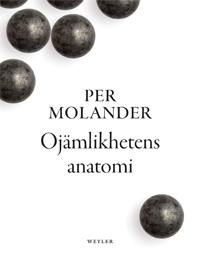 Per Molander’s list of publications comprises around 100 scientific papers, reports and books, including books on political and moral philosophy.